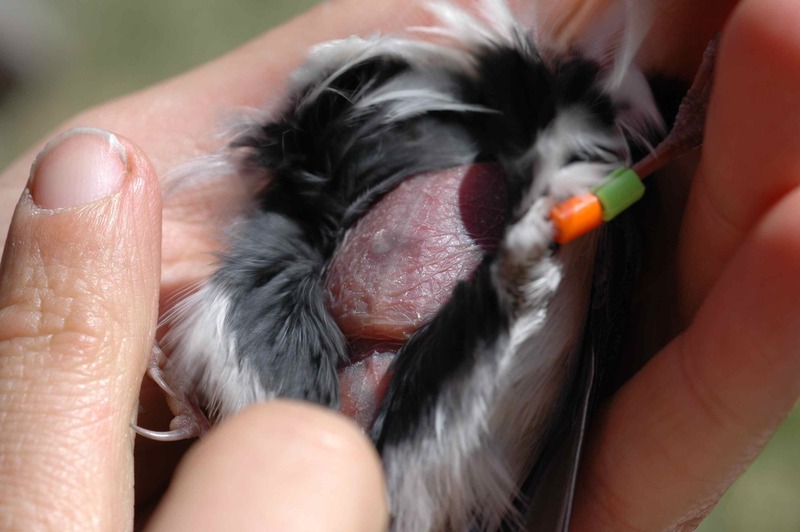 Brood patches are a good way to tell what breeding stage a bird is at, since usually the brood patch begins to develop during nest building, becomes very swollen with fluid (“edema”) during incubation, and then declines. I had planned to use brood patches to tell breeding stage with the juncos; however, I’ve been having a lot of trouble catching females, so it isn’t working as well as I’d hoped. On our last trip, however, we caught a for-certain-female junco with a brood patch! This looks like an early-stage brood patch to me—the skin is still pink and normal-looking, not swollen—so probably she is building her nest right now. This entry was posted in DEJU, field work, miscellaneous and tagged birds, brood patch, Dark-eyed Junco, eggs, nest, White-crowned Sparrow by toughlittlebirds. Bookmark the permalink. I got a picture today of my female junco’s brood patch — she is totally bare on her belly. Her first egg hatched 6/28/13 and three more eggs hatched through 6/30/13. We are in northern New Hampshire and it has been chilly and raining for two months — her nest is very exposed but she and her mate are soldiering on. They are nesting in a flower box on my porch railing. I wonder if her patch is bigger because she has removed more down to put in the nest to keep it drier. (Sorry for the late reply, didn’t see this until now.) How did the nest do? We lost one nest to cold rainy weather, but others made it, so they can definitely do it. A flower box sounds like a great place for a nest! And how did you get a picture of the brood patch – did you catch her? She was sitting on the flower box with a huge bare belly exposed … very swollen. Got a great picture using the zoom on my Nikon. They managed to fledged four chicks!